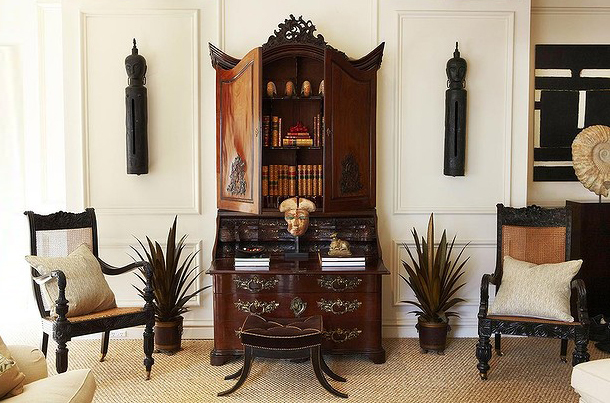 We always find it amazing to see how much character, charm and style antiques can bring to any interior. It might be less apparent than matching antiques with related styles in classical interiors, but in many cases mixing styles–the old and the new-give an energizing, fresh feeling to an interior. Just adding a piece of antique furniture, like one antique chair to a modern living room setting, can take the feeling of that room to a whole different level. But how do you do this, without the interior becoming fragmented? It would be easy if there would be ‘decorating rules’ to successful pairing of old and new furniture. We don’t think any rules can be the recipe for success. We see that breaking free from former ‘decorating guidelines’ actually creates the most exciting, interesting and distinguishing results. When selecting your pieces and accessories the most important thing is to stick with what feels right and looks good to you. Having said there are no set rules, it could maybe help to think about how you will use the room and what feeling or atmosphere you want it to radiate. Antiques can handle being used. When you do so the pieces become more integrated and less likely to stick out as stand alone displays, creating an interior in whole. Another way to select pieces is to look for interesting matches or contrasts with your current setting. Beautiful matches between contemporary and antique can be found in the contrast between materials; like polished wood placed on a solid concrete floor. But also in colours; like dark ebony sparking of against a white wall. And the same goes for patterns. Be as creative as you dare. So here we are, writing how much character a piece of antique can bring to just about any décor; from classical to contemporary. The proof of the pudding is in the eating, as they say. So here’s the proof. Please view ‘Interiors we Love’ on our website and you’ll see many examples ranging from leading designers to proud home owners. We hope that browsing will inspire you to mix and/or match as you like and with the desired impact for your unique home.